Gujarat may claim to have become one of the fastest urbanizing states in India allegedly with people's support, with the percentage of those living in urban areas increasing from 37 per cent in 2001 to 43 per cent 2011, but, according to an expert revelation, the number of villages resisting merger with urban development authorities (UDAs) has been on the rise, reaching 417 this year. In a yet-to-be published paper by Persis Ginwalla, development sector professional with Jameen Adhikar Andolan Gujarat (JAAG), and Sagar Rabari, associated with the land rights struggle and is Secretary, Khedut Samaj – Gujarat, has said that opposition to including their villages into UDAs was a mere 92 villages till 2014. In 2016 alone, there were 283 villages which resisted urbanization in Gujarat. 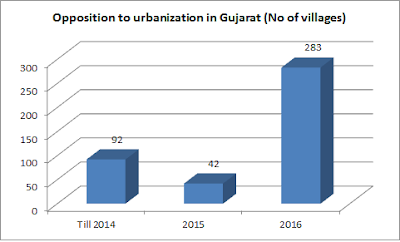 Titled "Resisting Urbanisation, Rejecting Urbanisation: Ground report from Gujarat", the paper says that while urbanization, according to the official view, is "supposed to be a positive indicator, growth, development and growing prosperity", in actual reality things are not quite different from what is being claimed. 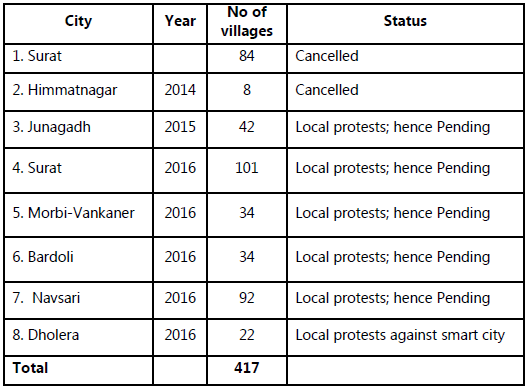 Giving details of the protests, the paper points to how the first Greenfield smart city in Gujarat, Dholera, is being resisted by the people of 22 villages in and around Dholera. "Proposed in an area of 92,000 ha. (920 sq. kms. ), which is an entirely agricultural area, this project is being vehemently opposed by the people of the area for whom this is an unacceptable proposition, one that is certain to destroy them", the paper says. Meanwhile, the paper says, "34 villages around Morbi-Vankaner, under the aegis of the Morbi-Vankaner Sheheri Vikas Sattamandal Sarpanch Association, undertook a series of protests – fasts, demonstrations – against the proposal to include 42 villages into the Morbi-Vankaner Urban Development Authority (MVUDA)." In September 2015, the papers says, "42 villages around Junagadh city (part of Junagadh and Vanthali blocks), which were to be included in the Junagadh Urban Development Authority (JUDA), protested against this move and agitated to get them removed from the JUDA". 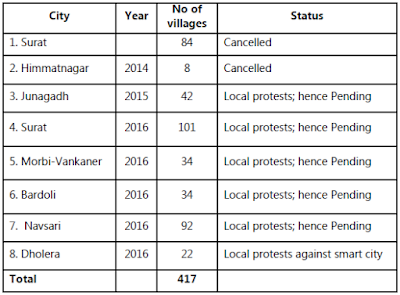 "This came on the heels of villages in Surat rejecting their inclusion in Surat Urban Development Authority (SUDA) twice and in Himmatnagar against inclusion in Himmatnagar Urban Development Authority (HUDA)", the paper points out, adding, "All these agitations are being led by local protest groups." The paper informs, "Following the protests, the first notification for Surat and the one for Himmatnagar were cancelled; the rest are pending" (see the table). The main reason behind the resistance, the paper says, is that people "want to continue with their occupation as agriculturalists and inclusion in Urban Development Authority (UDA) will automatically mean a deduction of nearly 40 per cent of their land (a provision under the Town Planning Act), making agriculture next to impossible and leaving them with the only option of selling their land." "At the very least this means that ‘one of the fastest urbanising states in India’ is doing so against the wishes of its people", the paper alleges, adding, "This is revealing an apparently new trend of popular resistance to urbanisation in Gujarat, whose people, it was believed, were eager to urbanise." Saying that "urbanisation, all along, has happened without people’s participation", the paper notes, "But more importantly, it should be borne in mind that the urbanisation that happened earlier was nothing more than a change in nomenclature and category." "A notification for merging villages with the existing UDA would automatically transform those rural populations to urban populations without, in any way, changing their economics, social setup or mode of life and living", the paper says. "The other aspect to this was the non-resistance to the change in nomenclature since it was accompanied by the assumption, now broken, that merger with the Municipal Corporations would bring them the much needed basic amenities without which they had been struggling for long", it adds. In fact, it says, "People have learnt that merger with urban authorities does not bring them the basic amenities – education, healthcare, transportation, drinking water, sanitation and sewerage -- and they have to remain at the same level and in the same situation as they were when they were ‘rural’."